Located on the small island of Sant Antioco, Tonnara is a campsite unlike any other. This luxury camping resort offers visitors top-quality facilities and fun-packed activities to keep the whole family entertained. This campsite has a large outdoor pool and there are plenty of sporting activities to enjoy including tennis and volleyball. With so much to do, a holiday to Tonnara comes highly recommended. Book a spacious and fully-equipped mobile home with LUX-camp and experience the camping holiday of a lifetime. There is a wonderful restaurant within this luxury camping site and it boasts not only a delicious menu including traditional Sardinian dishes but also offers a take-away service. Tonnara also has its own pizzeria and a fully-stocked bar that serves appetisers and ice-cream. 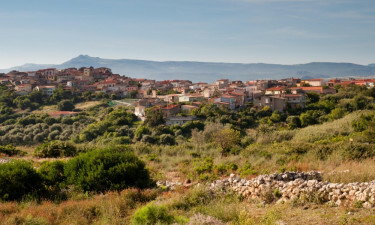 The small island of Sant Antioco is connected to Sardinia by road and with the vibrant city of Cagliari only an hours drive away, holiday-makers can take easy advantage of the restaurants and shops that make this city such a popular destination. Closer to the campsite, the small village of Sant Antioco offers guided tours around the 5th century Basilica di Sant Antioco and the exciting Museo Archeologico is well worth a visit. 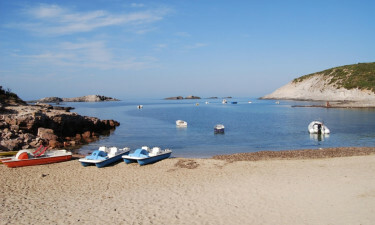 Although Tonnaro has its own private beach, visitors can travel to either Cala Sapone on the west coast of the island or take a boat trip out to Isola di san Pietro for some spectacular snorkelling and scuba diving excursions.